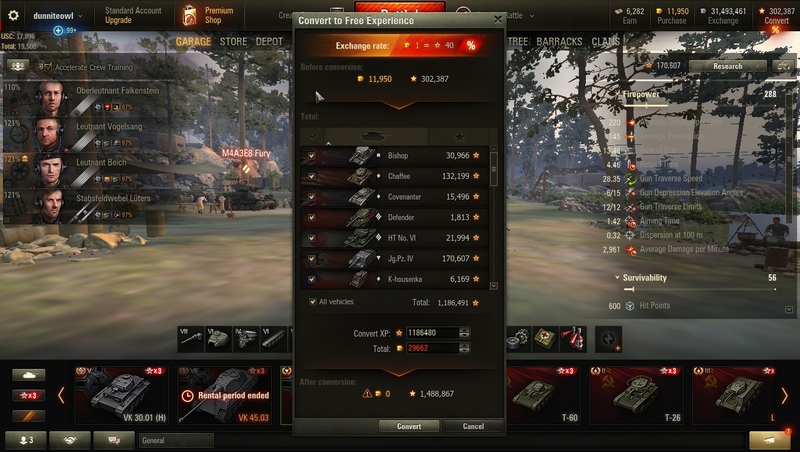 I have at least 20 fully researched tanks that had a fair amount of extra combat experience, that I use to convert to free experience with gold when the conversion ratio is favorable. This W/E the ratio is 40 to one, so I wanted to convert maybe 50 - 100k, but find that the combat experience of all the fully researched tanks is no longer accessible. This is only since the blueprints have been in existence. Is this a bug, or is this the way it is supposed to be. If not a bug, it is disappointing that we did not have a chance to convert the experience before it became inaccessible. If it is a bug (or I ma missing a way to do it), can the 40:1 be extended until after this problem is fixed. Edited by BrokenArrow77, Mar 24 2019 - 20:11. You have to check the tanks you want to convert XP from. Other than that it works fine for me so I don't know what else it could be unless you have a locker mod on and need to turn it off. I only show 2 tanks in my list when I click on the convert %. I have All Vehicles clicked. Having the same problem and nothing is locked on my free xp or gold and this only occurred since this blueprint crap came into being? Edited by SlappedbyRommel, Mar 24 2019 - 20:28. I haven't played since 1.4.1 came out so no blueprints. 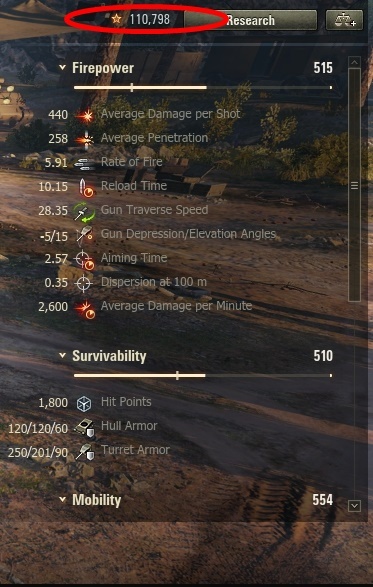 Just checked and I still show accumulated XP on fully researched tanks. FWIW. Could you upload a screenshot, maybe we can figure something out from that? I have converted free xp yesterday and it worked fine for me. Also, are you running mods? Guys if you're running mods try SAFE mode. I run some Aslain's mods (and a lot of garage mods) including the xp locker and have no issues. Finally got out of the TVP and free xp'd some of the Skoda modules then topped off some free xp while it's on sale. Just double checked. Even with the lock my xp shows and even with vehicles un-checked. Must be a glitch, mine are still totally convertible. However, once you convert a tank's XP it will not build up again unless you have the "Accelerate Crew Training" check box unchecked. In my case, I only get 2 tanks. 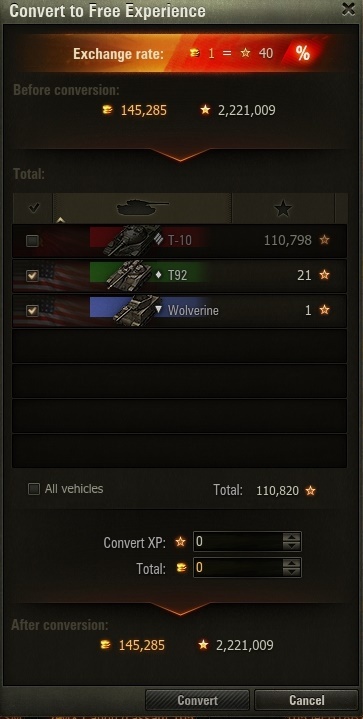 Too me, it seems that "Accelerate Crew Training" is turned on for the Jagdtiger... with 0 xp. Show us a tank that has TankXP showing up near the research button BUT not showing up in the Conversion screen? You have no XP to convert on that tank. You have to turn off accelerated crew training to build up XP to convert. Edited by I_QQ_4_U, Mar 24 2019 - 23:49. Are you looking at tanks that you have fully researched, or at ones that still have modules that need to be researched? Edited by Waarheid, Mar 25 2019 - 02:52. I had at least 100,000+ convertible experience (yes from fully researched vehicles) that disappeared with this update. I realize it says 0 right now, but it was not always 0. Anyways, impossible for me to prove, as I have no screenshots etc from before the update.